Just imagine: You did it! 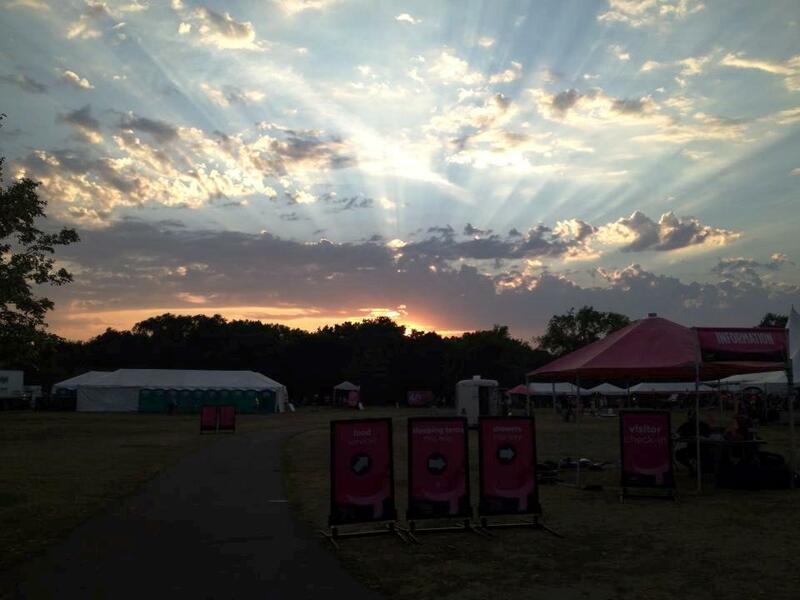 You finished Day 1 of the Susan G. Komen 3-Day®. You logged thousands of steps and boy, do your feet feel it. You filled up on string cheese, animal crackers and orange slices and you emptied your water bottle (and your bladder) a dozen times. You took a hundred pictures. You’re sweaty and spent, but looking ahead, you can see the pointy tops of a giant white tent in the distance, like the most welcome circus ever. You hear music and clapping growing louder. 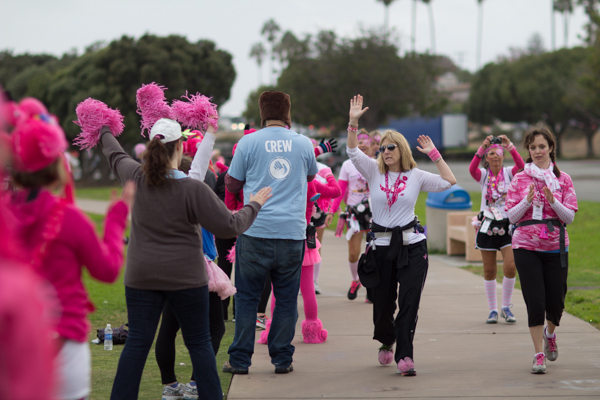 Suddenly, you’re filled with exhilaration as you approach the end point, surrounded on all sides by cheering admirers. The support you had all along the route kept you moving, and right now, it propels your tired body, arms raised triumphantly above your head, over the finish line. 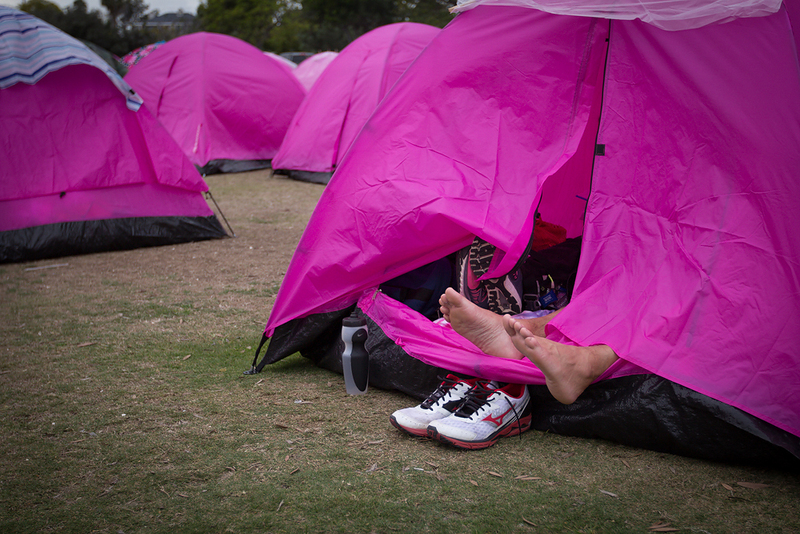 You’ve arrived at last to your home away from home for the next 2 nights – CAMP! Seriously? THIS is where I get to stay? Yes please! It’s a big, colorful, vibrantly delightful part of the full 3-Day experience. It’s the long-sought and welcome refuge at the end of a 20-mile road. It’s full of community and congratulations and comfort. Oh, sweet relief, it’s a warm shower! It’s a place where it is perfectly acceptable—expected, even—to wear your jammies to dinner. It’s where my team and I join each other again and share our stories from the route. Have you ever had one of those experiences where you get to the end of the day, then recall something that happened just that morning, and it feels like forever ago? THAT’S the 3-Day! There is SO much life packed into a single day on the 3-Day, that you can spend the whole evening talking and laughing and hugging and crying about things that happened just a few hours ago. And that’s what you do at camp. 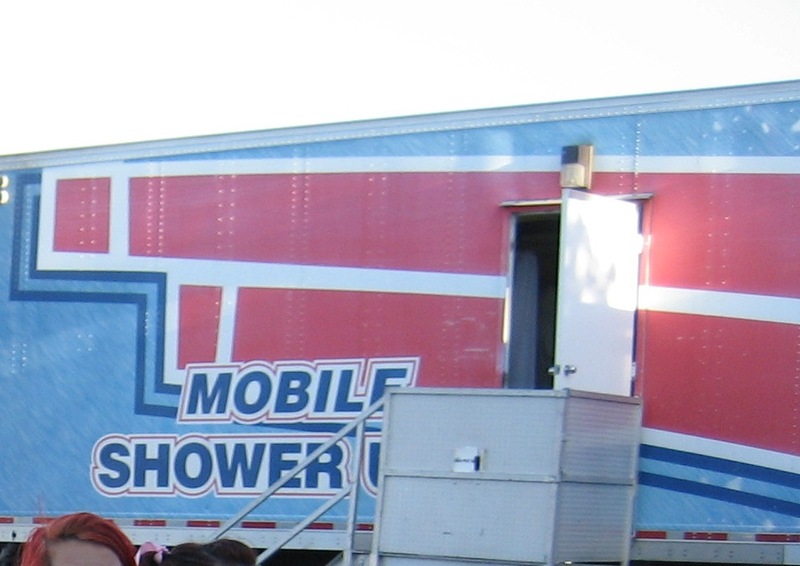 The fact that they have built showers into the back of semi-truck trailers is American ingenuity at its best, if you ask me. How else could you expect to get hundreds of road-weary walkers and crew members all clean and relaxed while camped out in a mobile city? Other bathing options may be passable (I’ve done mud runs where they literally hosed us down at the end), but the 3-Day shower trucks—like everything else on the 3-Day—exceed expectations. Each truck is divided into private stalls, complete with hooks and benches for your stuff, and you can take as long a shower as you want to. The water pressure is good, and I am pleased to report that I have never taken a cold shower on the 3-Day. Outside the showers, you’ll find baskets of sample-sized beauty products, as well as hair drying stations. There’s even an optional towel service that you can buy so that you don’t have to worry about packing up damp towels. It’s not uncommon to hear audible, sincere sighs of contentment from walkers exiting the showers. A clean walker is a happy walker, ready to take on more miles tomorrow. On the 3-Day, you will share a sleeping tent with one other person. Just you and a buddy, sharing a 6’ x 6’ tent. Some of you are panicking now just thinking about it, I can tell. But take my word, you’ll be fine. Your tent serves a very specific function: to cover you when you’re asleep. The rest of your time in camp will be spent out and about doing other things (which we’ll get to in the next couple of Insider’s Guide posts). You don’t need a whole ton of room for sleeping, and you’ll be so darned tired anyway, it won’t really matter much where you are. Remember that bag you dropped off early on Day 1? 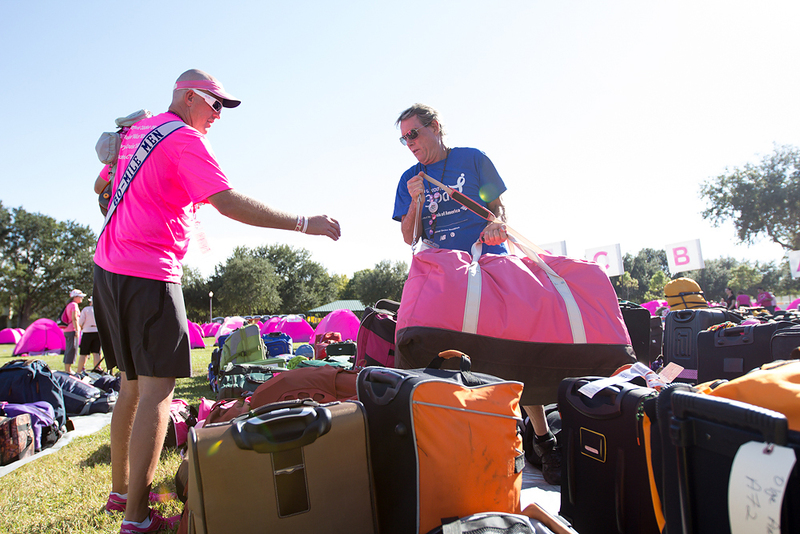 It’s waiting for you at camp, just like baggage claim. 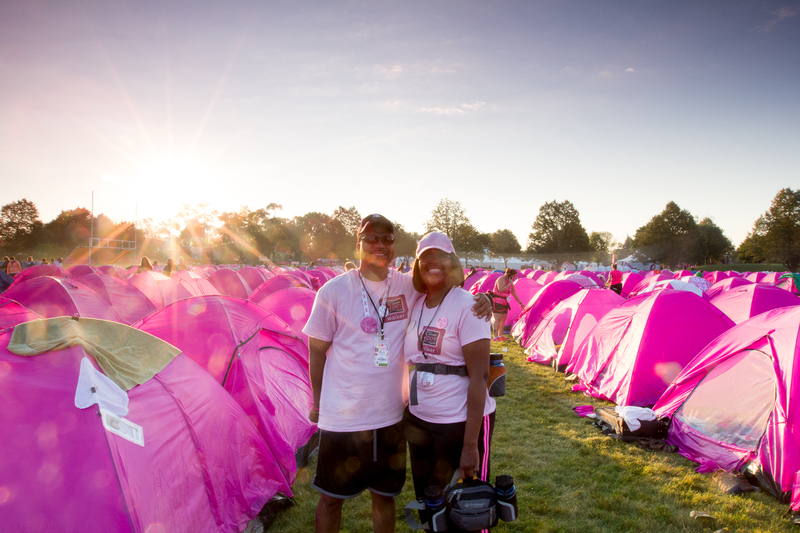 Volunteer “tent angels” will help you get your abode all set up. 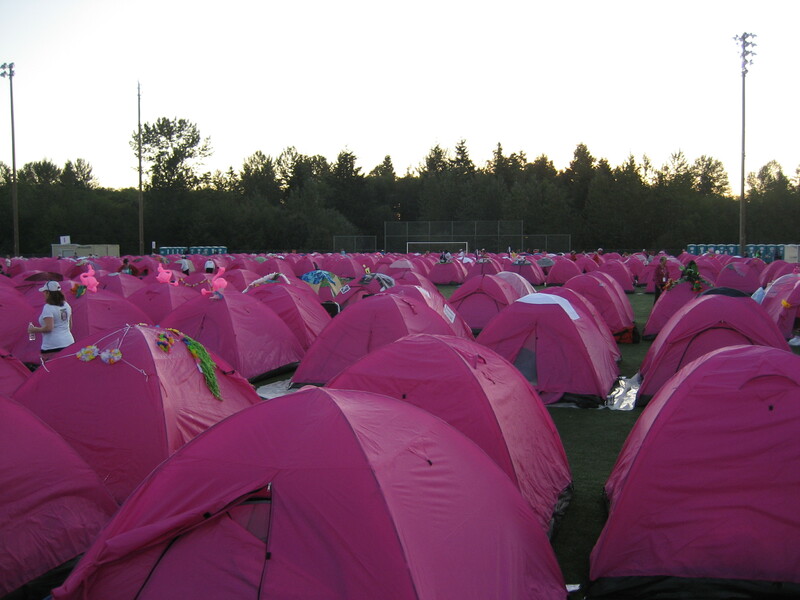 Take your tent, multiply it by a few hundred, and the result is “Tent City.” It really is a sight to see all of those charming pink nylon domes popped up throughout the campsite. 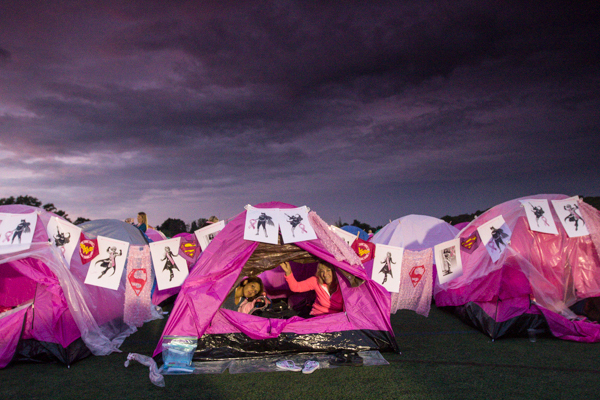 If you’re part of a team, your tents will all be next to each other, like your own little block party in the neighborhood. And like in the neighborhoods you walked through on the route that day, Tent City’s residents pull out all the stops on decorations too, decking out their tents in bras, banners, boas and balloons. You’re encouraged to decorate your tent, or if you decide not to, at least take note of the adornments on the tents near yours; it will help when you’re trying to find your way back from the porta-potties in the middle of the night (“I’m two tents down and one over from the twinkle lights and inflatable palm trees.”). Teams tent together, in all kinds of weather. Just another beautiful morning in Tent City. My TFL (Tentmate For Life) is my friend Sondra. We fill our little pink home with a queen-sized air mattress, which comfortably cushions us in our two sleeping bags, while still leaving enough room along the side for our bags. There have even been times when we’ve left our bags outside the tent at night (tucked nicely into enormous trash bags for protection from the elements) to give ourselves a little more space. We wear flashlights on our foreheads without feeling the least bit silly. We set our alarms for earlier than we’d like, but it makes it a little easier knowing that the other will rise and shine at the same time. We laugh at each other trying to maneuver into our sleeping bags, and we eventually zip ourselves in, then whisper and giggle for a few minutes, before the earplugs go in and we’re quickly asleep. 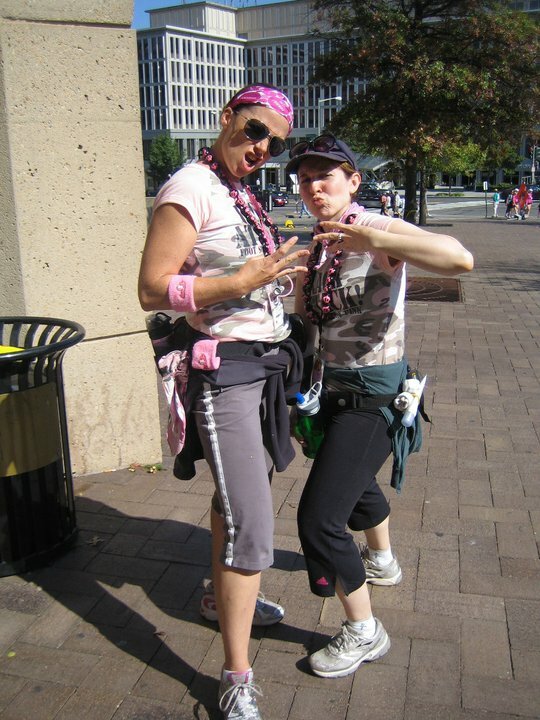 Me and my TFL Sondra, ready to take on another day! 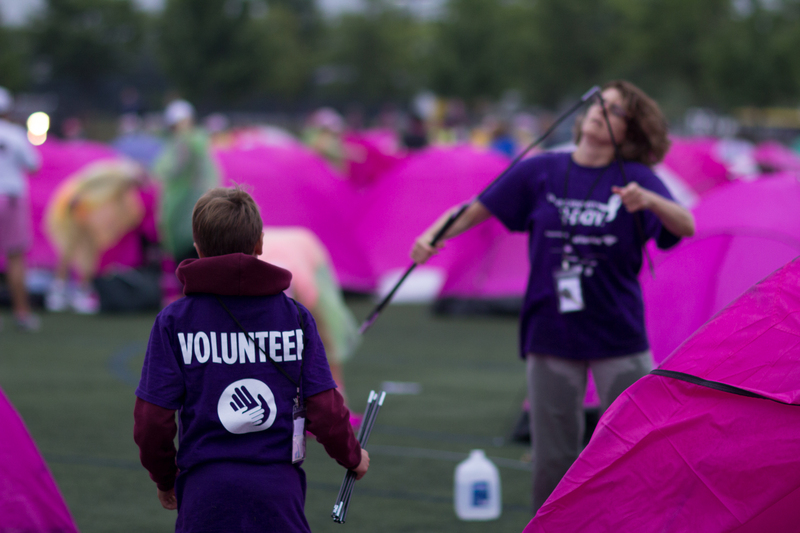 The next Insider’s Guide post will get into more of the exciting things awaiting you at camp. I don’t want to say too much now, so I’ll just tease two words: dance party. Walking in Atlanta for my first 3Day walk. Super excited and have lots of fun visions of what camp may be like. Thanks for the post, very informative article for us 1st timer’s – appreciate it! Just one thing to say at this point – BRING ON THE DANCE PARTY!! I had heard that in Atlanta, the tents are indoors. Is this true?? Yes, a couple of 3-Day locations – the ones that tend to have the most unpredictable weather – have camp located indoors. Everything is the same, just with a roof over it all (and indoor plumbing! ).